"I met Chuck about 10 years ago through the bar association. What a man, what a great life he lived. He would get my family free Reds tickets and we would sit in the handicapped section at GABP with him. Ill never forget the stories from back in the dayfrom Frank Robinson to Red Auerbach. He was a heck of a basketball player too and was one of the last cuts on the Celtics. My condolences to Cheryl and the rest of the Harmon family. Rest In Peace, Mr. Harmon." "Thanks for everything. Godspeed Mr. Harmon!" "As a young lady living on ridge acres I experienced meeting MR HaRMOn. STAY off the grass . our family sends our prayers"
"During difficult times when hearts become saddend, May support come through family and friends and from the God of all comfort." "My memories are with his son, Chuck. I worked with him at Cincinnati Bell on the Lifeline program. I remember when I first met him and heard his name, I said "like the baseball player." He looked at me like I get that question all the time, and I did not realize the relationship until many years later, after Chuck (the son) had moved on to something else, and I saw him in a video about his Dad. Chuck, I always enjoyed working with you, and I am sure that is a reflection of your Dad and your family. I did meet your Dad once at a local sports card show, and he was very much the gentleman. 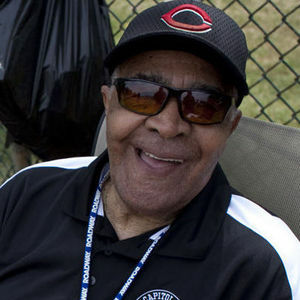 I now volunteer with the Reds Hall of Fame and have heard many stories from others who work there about your Dad attending games in his 90s and how good he was with the fans. My condolences to you and your family. I know your Dad will be missed. If you ever are at the Hall of Fame, I would enjoy seeing you again." "I had many nice visits with Chuck when he came to Gloversville. He always played golf with (and beat) my dad Hal. Condolences."